It's a very nice kitchen, although we didn't use it. The apartment is cute and comfortable and has everything you need. The bed is amazing. Location was excellent. Near the city centre and great restaurants nearby. 1. Overall location was easily accessible to public transport links & amenities inc shopping centre - 10/15 min steady walk. 2. Apartment was very clean with balcony. Lovely flat for a short stay. Very central. High speed WiFi. Good on communition with the landlord, we needed to come after midnight, there wasn't a problem with that. Very fluffy pillows. Practically fully equipped kitchen with gas stove and oven, big fridge with a smaller freezer. Washing machine and all the cleaning liquids. Dryer and iron are there as well. Clean and some extra towels were waiting in a cupboard under the TV. Lift and security in the building. Will come again in case of going to Warsaw once more. Comfortably can leave the keys in the postbox after leaving. 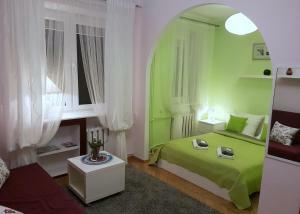 Lock in a great price for A.G - Apartamenty Warsaw Center – rated 9.2 by recent guests! One of our best sellers in Warsaw! A.G - Apartamenty Warsaw Center has well-equipped accommodations featuring free WiFi in Warsaw, a 15-minute walk from Palace of Culture & Science. Guests can grab a bite to eat in the in-house restaurant, which serves a variety of Seafood dishes. Ujazdowski Park is 0.8 miles from the apartment. The nearest airport is Warsaw Frederic Chopin Airport, 5 miles from the property. When would you like to stay at A.G - Apartamenty Warsaw Center? This studio has a microwave, stovetop and washing machine. This studio has a washing machine, stovetop and tile/marble floor. This apartment features a kitchenware, flat-screen TV and oven. House Rules A.G - Apartamenty Warsaw Center takes special requests – add in the next step! A.G - Apartamenty Warsaw Center accepts these cards and reserves the right to temporarily hold an amount prior to arrival. Please inform A.G - Apartamenty Warsaw Center of your expected arrival time in advance. You can use the Special Requests box when booking, or contact the property directly using the contact details in your confirmation. Spacious and We felt at home. Lack of cleaning products. Only two sachets of shower gel for two people over three nights is definitely not enough. Also several sachets of sugar in the kitchen. Enough to make two cups of tea (over three days). I am sure that if I had highlighted these issues to the owners, someone would have fixed all of that. However, this should have been thought through before the arrival. A pleasant, cosy apartment in a great location. Gregor was very rude and impolite. 1. Very loud drilling & hammering - extreme construction in room next door for majority of the day. 2. Opposite/ above restaurant & bar's that cater for young student's resulting in very loud music until early hour's in morning. Very large groups of loud students below room throughout night into the very early hour's. 3. Located on top 7th floor, although basic elevator to 6th floor still two flight's of stairs - friend with leg & back issue really struggled. The central heatting was turned on the day I arrived and it was still chill from the floor. I presume, the worm sleeper is a must during the cold season. No shutter blinds, but this is because used to have them to sleep in the morning. The landlord and his son who handed everything don't speak good English. They do not accept euros (but an exchange point that's open 24/7 is nearby). The windows are plastic but have sort of cracks in closing so it's noisy and colder than it could be (there is heating though that you can adjust yourself). Weird thing that there was only one curtain on one of the windows. The bed is not actually double but 1.5 however very soft and comfy. The water pressure in the shower isn't very nice.